Character: Brewed with Red Raspberries and aged in Cabernet Sauvignon Barrels containing Brettanomyces, Pediococcus, and Lactobacillus. Let me start by saying this again, as I have in the past… Sour beers are not for everyone! In fact, I hated them at first, but they have grown on me. I still don’t like them all though, as I am very selective when it comes to sour beer. I can say this is a good one. Avery is one of my favorite breweries, as they produce some very high quality beers from their regular year round to their unique one offs. This beer was brewed with raspberries, and then aged for 12 months in Cabernet Sauvignon barrels and also using three types of bacteria, Brettanomyces, Pediococcus, and Lactobacillus. I used a San Antonio Beer Week snifter glass for this beer, which poured an opaque dark reddish brown with a thin white head which left little lacing down the glass. The aroma is amazing of this beer with all it’s sour glory up front. There are nice tart cherry and raspberry notes present, and a lingering end of vinegar, which stings the nostrils a bit and remains in the nose for a while. Very funky! When this beer first hits your palate, you will immediately get that mouth ache you get with anything sour. You know that tingle feeling on your inner cheeks, the quick dry mouth feeling. Sourness aside, this beer packs some good flavors as well. Fruit flavors are present with hints of cherry and raspberry. There is a little sweetness from the barrel, but not much. I can also pick up on a bit of the red wine taste in the background. The body is not very heavy at all. Not much carbonation. Of course the tartness makes this beer have a very dry mouthfeel, leaving you even more thirsty. Besides the dryness though, this beer was pretty smooth going down. 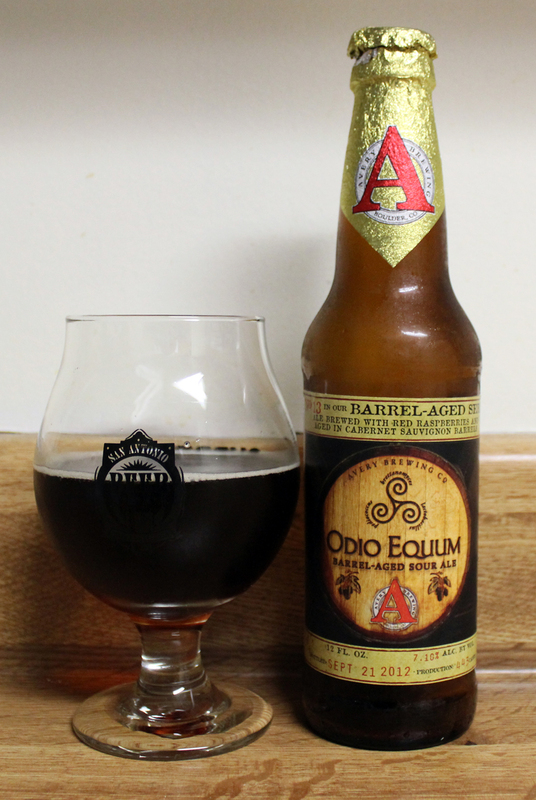 Overall, I give this sour barrel-aged beer a 5 skull rating, as this was an exciting experience drinking this beer. I hope you can find yourself a bottle of this, as it was bottled in September, 2012 with only 465 cases produced to be distributed nationwide to the best markets. Avery has a good line of this barrel-aged series. This particular one was number 13 in the series, and there has already been a 14th beer release, but an even smaller amount produced on that one. Good luck on the beer hunting for these. Metal Connection: For some reason as soon as I saw the name of this beer, the word Odio in the title automatically made me think of the band Odious Mortem. Here is the song “Collapse of Recreation” from their 2007 album, Cryptic Implosion on Willowtip Records. One of the awesome facts about this song is that the guitar lead is played by San Antonio, TX born Metal Legend, Ron Jarzombek (S.A. Slayer, Watch Tower, Blotted Science, Gordian Knot fame). Just as awesome this beer is, this song is equally as good with an added extraordinary point with this amazing guitar lead. It’s weird loving Sour Beers this much, BeerMetalDude!